February was a positive month for global equity markets. At home the S&P/TSX Composite was up 3.9% and south of the border, the S&P 500 was up 5.5%. Even when “Grexit”(Greece’s withdrawal from the eurozone) was looming, many European stock markets ignored the noise and appreciated. Greece and its creditors, the European Central Bank, the European Commission and the International Monetary Fund (collectively known as the “Troika”) have agreed upon terms to avoid what was once one of the most feared domino events following the global financial crisis, that is Greece withdrawing from the eurozone. 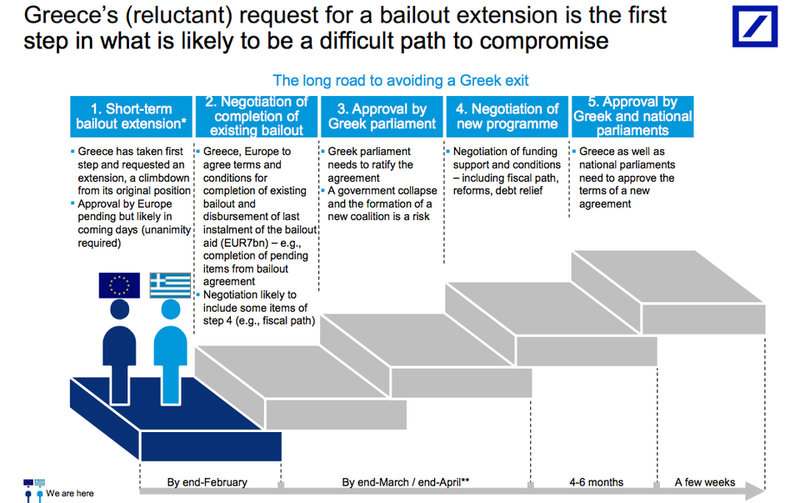 Last week, Greece presented its reforms to secure a 4-month extension to its financial rescue deal. By the end of the month an extension until June 30 was approved by the Troika and, importantly, was ratified by the German Parliament. Even with a deal in place, there is a long road ahead to prevent a Grexit. Canadian corporate and government bond prices held steady through February. Next week the Bank of Canada will meet to review its interest rate policy and make an announcement on March 5. It has been over a month since the Bank’s decision to cut rates by 0.25% and that announcement sent shockwaves through the Canadian marketplace. This upcoming announcement will be closely watched to gauge the Bank’s view on the effects of the rate cut and the balance of risks to the Canadian economy, of particular concern is oil prices. Janet Yellen, Chair of the Federal Reserve, addressed Congress. Yellen reiterated that economic growth and job gains outweigh low inflation, and the Fed will consider increasing rates at some point. Other Federal Reserve governors expressed concerns that the risk of raising interest rates too soon outweigh the risk of raising interest rates too late. As this internal debate at the Fed continues the common theme is that an increase in rates is expected, eventually, but for now rates remain low. In this low-interest rate environment, yield-producing assets, such as high yield bonds and REITs, have become increasingly attractive to income-seeking investors. Despite REITs exhibiting poor performance at the end of February, they had a great start to the month with the S&P/TSX Capped REIT Index hitting its highest level since June 2013.